If you would like to report game bugs and discuss new features then we can start it here. Recently we added Freeway multiplayer mode, to anybody who tried it out, please let us know if you find bugs or problems. We noticed that sometimes in multiplayer mode, game music becomes jerky. Did you experience anything similar? - Previous version had an ugly bug where game will run out of memory and crash when staying too long in the menus. This bug couldn't wait, so we did a quick update. - Small improvement in multiplayer lobby: you can see how many players are currently playing multiplayer. - You will see green light on Freeway rooms when there are real players in the race. I played Freeway. It was interesting and fun to see planes all over the place. I think there is also some bug there. Sometimes I don't see other planes, only player's icons. I tried to play freeway multiplayer last evening but could not get in. It said I could not connect. I was able to fly all the regular races with no problem, however. I checked game updating procedure and found that game wasn't updating itself to the latest version everytime! Next time game updates itself you should see Freeway icon on the main menu if update was successful. Thanks Zvone, I think you already spotted a bug in Freeway mode, we are trying to fix the problem now, we will update game again when it's ready. Also it looks like this happens once in a while? Freeway multiplayer worked for me last night. It worked well. Great fun! We just fixed the bug and updated the game. Update should be automatic next time you play. Otherwise, next week we will officially invite people to join the game. We're making a video based on replays all you guys did. Multiplayer "freeway" was very choppy for me tonight. A major stutter every two seconds or so, throughout each race I flew. Thanks for confirming our suspicion about internet problems. We experienced the same stuttering that comes and goes. I was guessing it was our internet provider or some piece of hardware problem. We will look into it. In the latest version, I believed the problem with choppy multiplayer is fixed. If you still see some problem, please let us know. It is much, much better now. No problems at all for me now. It's great. Thanks! Amazingly done with so limited resources! Very nicely tuned engine, I easily get over 60 fps average at ultra on three monitors with nvidia surround. But... It looks kinda weird. The problem is that it looks zoomed in, I am too close to the plane (I have this feeling with one monitor also). Could you please add a slider so you can get farther back? The cockpit view seems a bit angled up and when I use it I have a bit of trouble getting level with the ground. Don't know if this is just me or what, but I would like a field of view slider for it. When you are in game and you choose a map, I would like it to be so that when I press enter it jumps to next. Now you have to press down and then enter. Same with most menus I think. Also it should by default be on the maps not on the next button when you go into the license mode for example. Can you fix so it saves your preferred control setting? I mean between standard and expert controls when you start the game. I love all the options you have put in the game already so I hope some more isn't out of the question. Thank you for your suggestions. We haven't received any complains about how close the plane is to the player, I guess FOV (field of view) is too big in your opinion. If it bothers players then we will certainly tune this part. 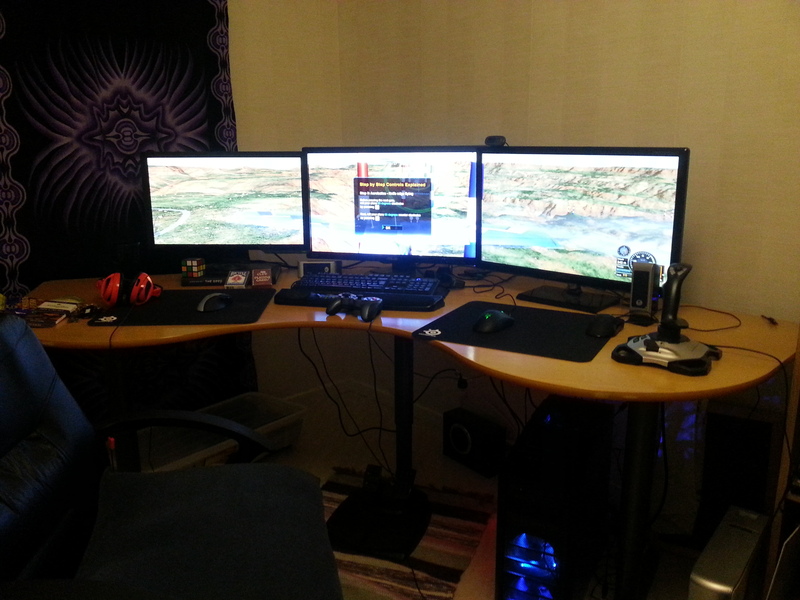 You mentioned you are using 3 monitors - is game view stretched over 3 monitors? In that case plane will end up in your face for sure. We will fix preferred control setting soon, I understand your annoyance, it's not like people change controls often (if ever). PLEASE do not automatically install to the C:\ drive. I have a SSD which barely enough space for windows as my primary drive and I REALLY do not want to install any game there. Maybe I'm just stupid, but I have tried installing numerous times now and have never found an option to change the directory. I understand your point especially with SSD drive, we will have to put some option to be able to pick installation directory soon. The reason why it was done this way is that game updates itself to the latest version quite often (and C:\ProgramData) in directory suggested by Microsoft. Some other online games (ex. Need For Speed World) also use it for the same reason. If user has directory that can be updated when the game starts, then picking directory should be possible. Otherwise, wish you good luck with flying and little crashing. Yeah I would be happy with some more distance to the plane, maybe have three predefined viewdistances like in many carracinggames? When I play with three monitors the resolution is 5760*1080 so the stretch should be the same as one 1920*1080 monitor, but somehow the plane gets really big and the wings extends a bit onto the sidemonitors. Also a button on the forumpage to get back to the gamepage altitude0.com/ from the forum. I haven't found one. Thanks for all the constructive ideas. We tackled some easy fixes today that you suggested. Forum title is now clickable to take you back to the website's front page. Subfolders are coming soon. Your last used ingame controls are saved so that the next time you play, controls will already be picked (standard or expert). 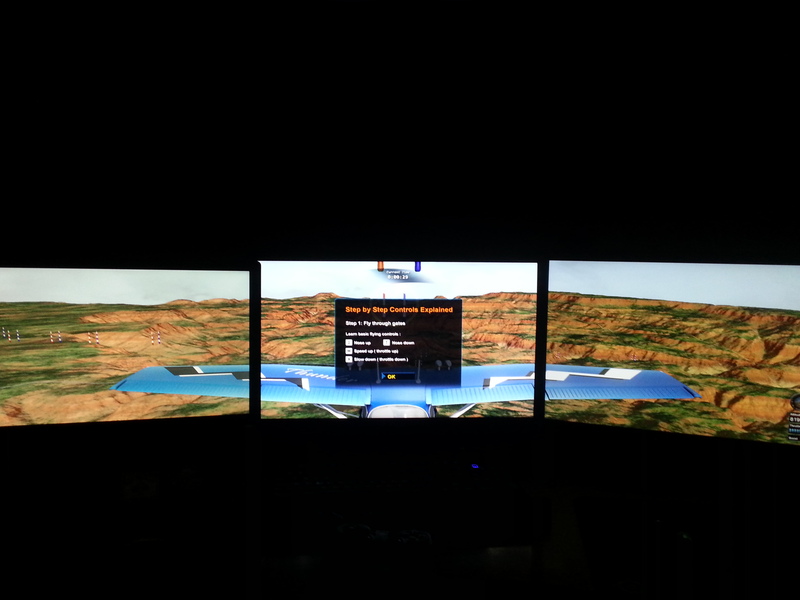 We will fix "airplane in your face" problem soon, it's just that I've never seen Altitude0 on 3 monitors! Wow, that must be cool. Can you please send some photos of your computer screens with Altitude0 on it, we would love to see this gaming rig. Some pictures on how it looks on three monitors. I hope you don't mind I would like to put one picture on our media page. This looks just too good to miss, it makes me want to get another monitor (2 monitor setup is pathetic / split screen is in the middle). I see you also have pedals. Currently some pedal configs have problems, I wonder if yours work. Actually one of "master" players Biggles has been using rudder on keyboard for way too long, got to fix it soon. P.S. If you let us use the image who should credits go to (image by Zakor)?